It's interesting that Shaun and Joni can go on tv acting like exceptional parents when he has denied his oldest daughter for 15 yrs. So sad. Then he brags about parading them around with their new boxed in trailers that hauls their $10k worth of pageant stuff. Everyone from our hometown knows what he's really like. I feel so sorry for those kids. They didn't show MaKenzie's candy wear routine (why, I don't know). The Minnie Mouse was her outfit of choice. 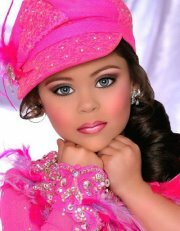 The pageant had three competitions: beauty, outfit of choice, and candy wear. Fun Little Side Note: the girl who won Ultimate Grand Supreme, Sadie Brown, was followed by TnT in Season 2. She won ultimate at Southern Glitz Open State. There were a lot of TnT girls in this episode. T&t does that a lot-- shows one routine in the place of another. Alexes's ooc was substituted for "American wear", and brock's talent was shown in place of his outfit of choice. Also, the songs used are not typically the ones the kids actually performed to. In "glitzy divas", ever rose is shown performing to "let's roll the dice", but her routine was actually performed to "sharp dressed man". Did we see the same episode?! Those sisters were SO mean to each other and seemed to get joy out of hurting one another's feelings. I thought they were horrible brats and not sisterly at all.